Home > Boston, Hockey, Uncategorized	> Champions! The Bruins outscored the Canucks 22-1 since Nathan Horton got hit. Tim Thomas wins the Conn Smthe Trophy and posted the first shutout on the road by a goalie in a game 7. Bruins win the Stanley Cup! Hope your victory dance was ready. Haha. I never had a problem with specificity. I had a problem using made-stats to substitute for analysis. 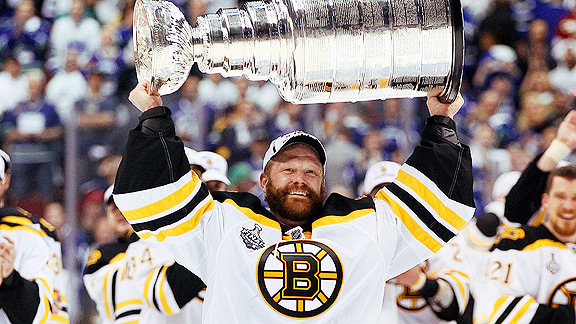 Tim Thomas producing a shutout in a game 7 on the road is a remarkable achievement. Outscoring the “best” team in the NHL after one of your top forwards goes down is similarly incredible. I think it also may be representative of their change in style, which made them successful after 2 losses in Vancouver. Tricky Math Home Schools: The New Melting Pot?